Mar de Ons gives you the opportunity to sail for an hour and a half along the Pontevedra estuary while enjoying an amazing panoramic view of the estuary and Ons Island. We will venture and sail near Aguete beach, the Naval Military School of Marín, Tambos’ Island, Combarro and Raxó, while tasting one of the best local products on board: freshly cooked mussel. You will discover the true taste of the sea! Mar de Ons invites you to enjoy this amazing maritime tour across the Pontevedra estuary. We will come closer to the bateas (wood decks at the sea), commonly known in Galicia but nowhere else, and you’ll learn about the mussel farming process with our guides, experts in these bivalves. 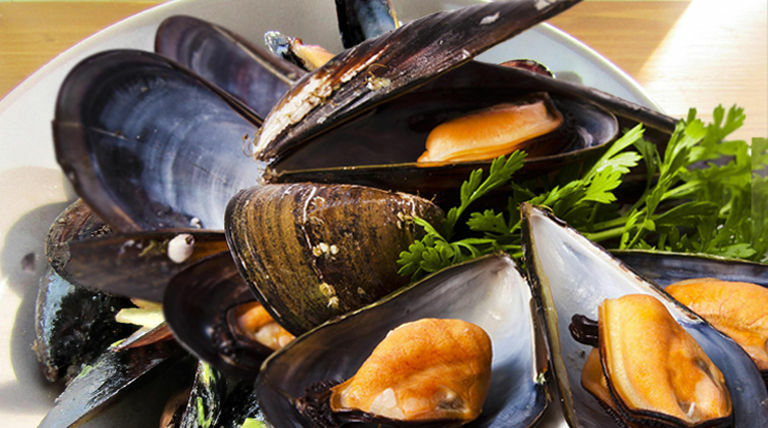 Taste our exquisite mollusk accompanied by local wine, water or refreshments. Enjoy one of the most representative maritime tour of the Rías Baixas with us. Let yourself be surprised by the amazing tour views while tasting traditional products of the highest quality. Furthermore, you will have the chance to look at the sea bed while listening to a traditional bagpipes group. If you want to learn more about our region and its traditions, this is the best opportunity. The estuary tour surprises tourists and local residents alike, it is a unique and different experience, and there are always new things to discover! No wonder, some of the visited zones are, in fact, of international interest. Combarro for example. There are many who claim that it is one of the most beautiful towns in Galicia, with its traditional hórreos (a typical Galician granary) at the Pontevedra estuary. It is an amazing landscape to enjoy while sailing. In summer, we organize daily trips from the ports of Sanxenxo and Portonovo. Check our schedules and availability. Book your tickets now! If you are looking for experiences that are more especial on board, do not miss out on a night to remember while enjoying the Tears of Saint Lawrence ore the famous Bouzas’ Fireworks. If you have any queries, do not hesitate to contact us.